I went to an interesting workshop last weekend on queen breeding. For all you non-beekeeper readers, that’s a subspecialty of beekeeping, where you select and raise queen bees. This is one of the cornerstones of what beekeeping is all about, because it’s how humankind has been breeding specific strains of bees for centuries, much like we’ve bred dogs for retrieving and cows for better milk production. In the case of bees, we breed to get bees that sting us less, make more honey, survive the winter better, and in the last decade, we’ve been working to breed bees that are resistant to the varroa mite. The process is fairly complicated, involving careful timing, manual dexterity, and a good understanding of bee biology and lifecycle. 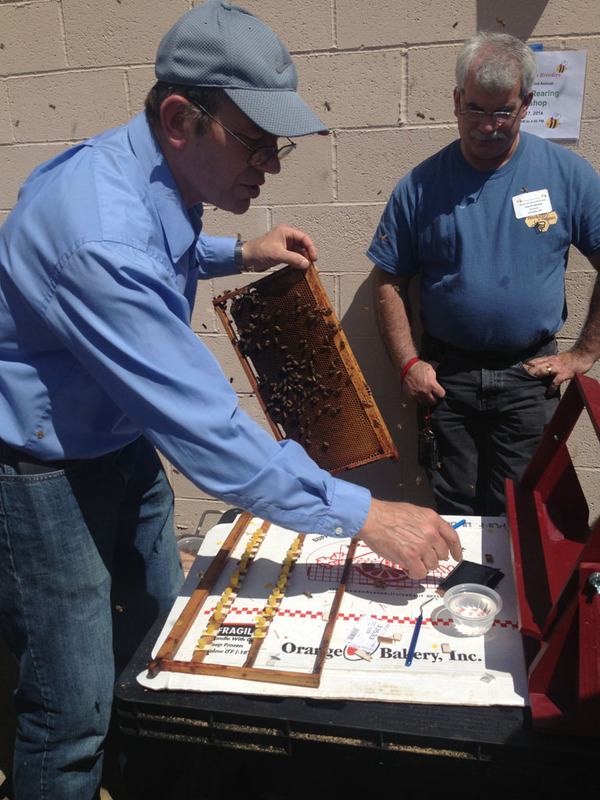 Few beekeepers do it, leaving it mostly to beekeepers that specialize in the process. For me, it’s the last great frontier of beekeeping knowledge that I’ve not yet explored. 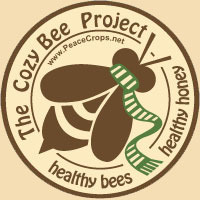 Our county beekeeper club, of which I am the current vice president, has decide as a group that we want to start a regional bee breeding program. The idea is that we’ll work to breed a strain of bees that is better adapted to our wet maritime climate. Pretty ambitious stuff, but we have the support and encouragement of some very knowledgeable people with PhDs in this sort of thing at the OSU Bee Research Lab. Four or five of us are attending to seminars, but everyone else in the group has volunteered to take the queens we raise, field test them, and give us data in return. It’s a multi-year project with a lot of people involved, and it should be very exciting. The conference itself was not long, but packed with information. They held it at the OSU Bee Research Station, a cool place I’ve mentioned before. In the picture above, one of the lecturers is demonstrating a tiny (and particularly cute) miniature beehive used for queen mating. In the background is the funny part, though. We were told to bring our protective gear to the seminar, but the first half of the day was classroom stuff so we all left our veils in our cars to begin with. Right after lunch, though, the seminar sort of spontaneously restarted as we were all standing around yakking. The main speaker brought over a hive of bees, popped it open, and pulled out a frame of comb as he was talking, bees zinging around everywhere. These beekeeper gatherings are hilarious, because if you did that in a crowd of 30 normal people, you’d have screams of terror and people running around like their hair was on fire. Here, nope. I’ll be honest, I dislike getting stung, and normally wear a lot of protective gear. A few people (like me) looked around kindof nervously, but everyone else was like, “ho, hum” and taking notes. 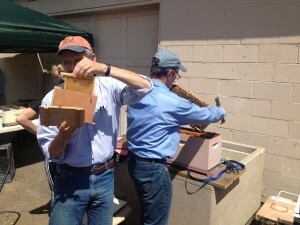 The speaker chuckled, and then let the newer half of us in on the joke… the hive he was working had been set up two days before as a breeding hive, which means that they pulled frames of “house bees” (bees less than 2 weeks old) and brood, and separated them into this smaller breeder hive. House bees have not-yet-fully-developed venom sacs, and are also instinctively disinclined to sting. Or even fly much, for that matter. But I’ll be honest: a few minutes later when I found myself holding a frame of brood in one hand and a grafting tool in the other, bent over this open hive, bees crawling on my arms and neck, I was sweating. In all, a great seminar, and I’m excited to start raising my own queens. But it will have to wait until next spring; my new hives are all too young for this , and I’m also far too busy with the house that we’re still not living in yet. But it was cool to get the knowledge, and now I have time to get prepared to jump into queen rearing in 2015. 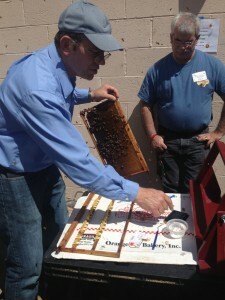 This entry was posted in Beekeeping, News and tagged beekeeping. Bookmark the permalink.